As of April 1, 2018, the International Friends of the Tsoknyi Lineage Nepal Nuns now represents the Tsoknyi Lineage Nuns of Nepal and Tibet on Rinpoche’s behalf. 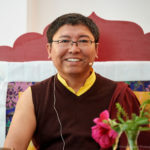 Up to date information on the Nepal and Tibet Nuns, as well as fund-raising efforts and requesting prayers are now accessible through a beautiful new web site: www.tsoknyinepalnuns.org. Please visit the new web site for more information, donations to the Nepal and Tibet Nuns, and requesting prayers. Information on the Tsoknyi Lineage Nangchen Nuns that has appeared on this web page below for the past several years will remain here for your continued enjoyment, but please bookmark www.tsoknyinepalnuns.org on your system to stay current with the latest news of the Nepal and Tibet Nuns. The nuns’ story is a classic example of dedication and tenacity. Organized in nunneries comprised of several “Ani houses” (dwellings where up to 15 nuns live together), they perform their spiritual practices in a group, teaching and helping each other all their lives. Many nuns do three-year, nine-year or even lifetime retreat. On retreat, each nun sits all day in meditation posture doing her yogic practices and meditation. The nuns’ daily routine captures a timeless scene from the past. A typical day starts around 3:30 a.m., as the nuns wake and immediately start their first three-hour practice session. After a short break for breakfast, they resume their second session, ending at lunch. The third session occupies the afternoon, and after a light evening meal, they complete their fourth practice session. They then continue sitting throughout the night, practicing dream yoga. Many of the nuns are accomplished masters of difficult yogic practices such as tummo (the yoga of inner heat). They perform yearly rituals for the public that include a long procession around the center in the dead of winter in sub-zero temperatures, with only a sheet wrapped around their bodies. During the night, hundreds of the most adept nuns wet their sheets repeatedly in buckets of melted snow and continue their procession, drying the sheets again and again with the inner heat generated by their yogic practice. This very rare and awe-inspiring event, as well as the realization of the elder nuns, have gained them respect and renown throughout Tibet. 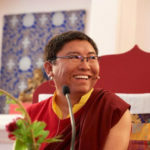 In a culture where female practitioners have struggled to gain respect, these nuns have risen to a high level of status, with many monks and lamas seeking their teachings and instruction. Not only is the power of their practice evident in the atmosphere of harmony and cooperation within the nunneries, but also there is a profound impact on the surrounding communities. When people meet them, even while conducting the simple tasks of daily life, they are changed for the better. How does this happen? 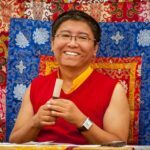 From a dharma perspective, it is because they have become rich treasure stores of palpable virtues, such as inner peace, love and compassion. The communities and villages that surround the nunneries become very peaceful and markedly happier as violence, alcoholism, excessive drinking and harmful smoking habits dramatically decline. Even harsh speech becomes rare. Many villagers are inspired to be vegetarian. The nuns also serve the community through spiritual support and counseling, helping with ceremonies, death and so forth, giving love, compassion and emanating peace directly into people’s minds. This is a tangible example of the power of spiritual influence. The values that nuns have—peace, love and compassion—affect an entire community and continue to branch out to the rest of the world. In summary, the nuns’ lives exemplify the power of living Dharma and its realization to transform the hearts and minds of the surrounding communities. In the summer of 2005, Tsoknyi Rinpoche led a group of western students along with a photographer and video crew to Nangchen to document the lives and needs of the Nangchen Nuns. Blessings is a feature-length documentary DVD by Victress Hitchcock of Chariot Productions that offers a rare glimpse into the lives and faith of these extraordinary women. The Nangchen Nuns need health care, food, shelter and emergency relief. Blessings contains extraordinary footage that was collected on the journey to Nangchen. The DVD is available for purchase through www.chariotvideos.com. To view the Blessings trailer, please click here. For more information about the Tsoknyi Lineage Nangchen Nuns, please read the Home Fundraiser Newsletter and the June 2008 Nangchen Nuns Update for a better sense of these phenomenal female practitioners and their simple daily needs.